Why is Polyjacking a Better Option Than Traditional Mudjacking? When compared with traditional mudjacking, polyjacking is the new kid on the block. It is quickly making a name for itself, though. Mudjacking costs less but is looked at as more of a temporary fix, whereas polyjacking is considered a permanent repair. The method of traditional mudjacking involves drilling holes in your driveway or other surface and pumping a slurry mix underneath. The slurry is commonly made up of cement, mud, sand, and crushed limestone, which is mixed with water. The slurry flows under the concrete and the slab is raised until it is once again even with the rest of the driveway or patio. Once pumping is done, the holes are patched over. Polyjacking is similar to the mudjacking application: holes are drilled into the slab that needs to be repaired but instead of a slurry mix, a polyurethane foam is injected. The foam expands, filling the voids and raising the concrete to its required height. The holes that were drilled are patched over and you’re good to go in a fairly short amount of time. Now you may be thinking to yourself that mudjacking is the least expensive option so that is probably the best way to go. However, there are a few more points you may want to consider before you make your decision. As we learned above, both methods involve drilling insertion holes into your concrete. Polyjacking uses holes that are around 5/8″, or the size of a penny, whereas mudjacking holes can range from one to two inches, a sizeable difference. The foam expands between four to fifteen feet from the injection point. Due to the thickness necessary in the mudjacking slurry, it can only spread about a foot or two. So, not only are the polyjacking holes smaller, less of them are needed for the same coverage, fifty to seventy-five percent less, in fact! We mentioned that mudjacking slurry is thicker than foam and it is also considerably heavier. A cubic foot of slurry weighs a hundred to a hundred and fifty pounds, which is a considerable amount since the same volume of polyjacking foam weighs around three to four pounds. If the underlying soil is already unstable, the weight from the slurry can cause more problems than it solves, as heavier mud can worsen existing problems. 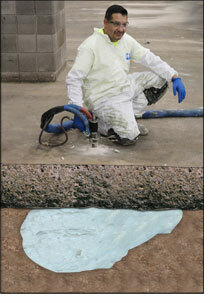 Polyjacking foam expands under the concrete, filling any voids and stabilizing the soil underneath the slab. Due to the thickness of the slurry, it cannot accomplish the same thing. Although numerous holes are drilled to try and get a good spread of mud, completely filled voids are rarely achieved. Additionally, water can wash out the mudjacking slurry, leaving you with the same problem, or possibly a worse repair in the future. Polyjacking foam won’t wash out and is considered a permanent repair, not a temporary fix. Get a free online quote today so we can help you with all of your concrete slab repairs. What is the Difference Between Mudjacking and Polyjacking? Concrete repair is a cost-effective alternative over concrete replacement because of the development of mudjacking and polyjacking. 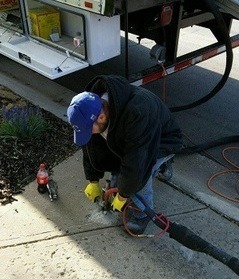 Trying to find the best concrete repair solution can be a difficult decision. 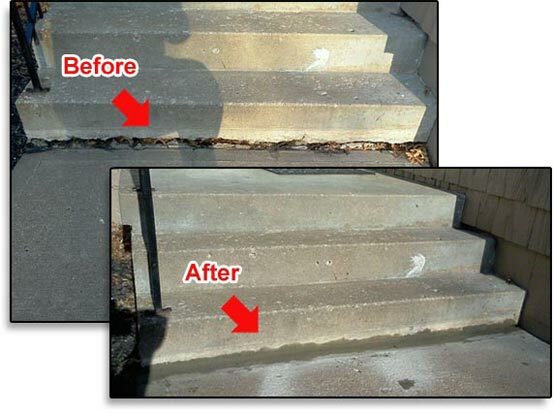 That is why our experts can help you decide the best concrete option for all of your concrete repair needs. Most people know the term ‘mudjacking’, but not ‘polyjacking’. 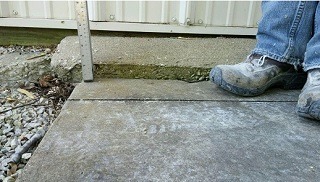 These two concrete repair methods are similar, yet different. They both are used to repair sinking or uneven concrete surfaces caused by poor soil conditions under the slab. Our concrete repair services can fix driveways, porches, concrete slabs, garages, basement floors, foundation slabs, sidewalks, and concrete steps. However, polyjacking offers more benefits over mudjacking. Mudjacking requires heavy equipment and numerous mudjacking trucks for installation. 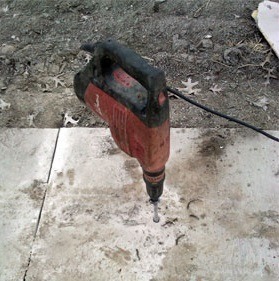 The process involves drilling large holes (2-3″) into the concrete surface, but the end results may not be permanent. The curing time could take hours to days. 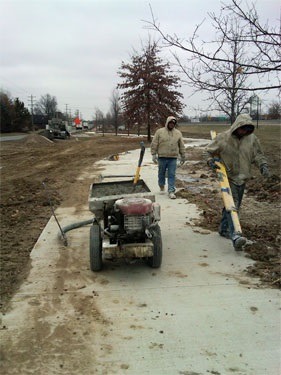 Unlike polyjacking, mudjacking can only be used in above freezing temperatures and the cement mixture that is used can be susceptible to shrinking. On the other hand, polyjacking doesn’t need heavy poly equipment and only one truck is needed for the project. 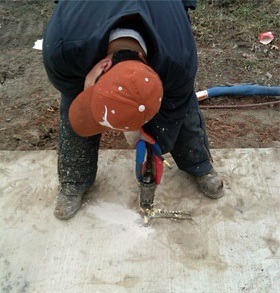 Small, 5/8″ holes are drilled into the concrete and the final outcome lasts longer than mudjacking. 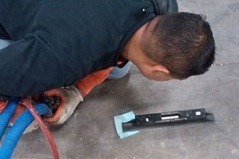 Another advantage to using polyjacking is the simple installation process that uses high-density polyurethane foam instead of sand grout to raise the slab to the desired height. The use of polyurethane under the slab allows it to expand and cover all areas without shrinking. If you want to save time and money, polyjacking is the best alternative to concrete replacement and mudjacking. 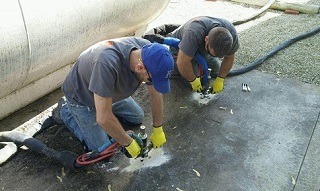 Polyjacking.com will enhance the overall appearance of your concrete surface for many years to come.